“[No heading].” Hamilton Spectator (Vic. : 1914 – 1918) 6 Jan 1914: . In 1951, the residents of Hamilton banded together in one of the greatest community efforts the town has ever seen. From 6am to 10pm on a Saturday in December, a team of people met to dig a 165 feet by 50 feet Olympic size swimming pool. Over the next two years, the volunteers continued their working bees building change rooms and a filtration plant until the pool opened for the summer of 1952/53. The pool still serves the community today and it’s where many children have learnt to swim, including me. 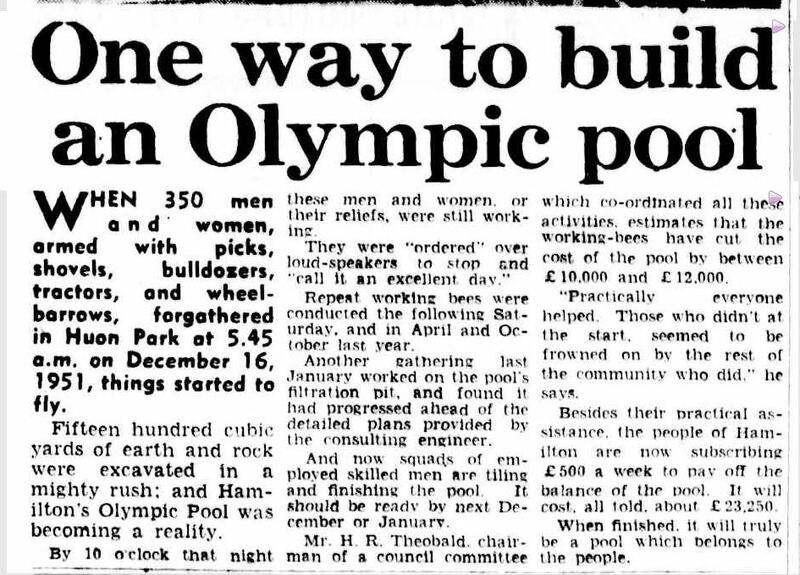 “One way to build an Olympic pool.” The Argus (Melbourne, Vic. : 1848 – 1957) 21 Jul 1953: 20. <http://nla.gov.au/nla.news-article23257036&gt;. Hamilton’s pool was the talk of Victoria and leaders of country towns met trying to emulate Hamilton’s efforts. The Horsham Times of December 18,1951 published the comments of Mr Powell, the headmaster of the Hamilton and Western District College. He said the efforts of the volunteers “marked a re-awakening of civic pride in Hamilton.” Continuing, he said the town needed a pool and “a community effort was the best way of attaining it”. While it in no way rivals the efforts of the people of Hamilton over 60 years ago, recent activities prove the same community spirit is not dead. For a week, Hamilton people past and present banded together to make sure the Hamilton Spectator moved a step closer to digitisation at Trove. And it did, achieving 59% of the vote. The ‘Spec’ hit the lead early and as the week progressed, the stand out rival was the Gympie Times. The Gympie supporters were giving it a real push and by last Saturday, the Gympie Times had hit the lead. But Hamilton supporters rallied and by the close of voting on November 30, from a total of 31, 658, the Hamilton Spectator received 18,836 votes and the Gympie Times 10, 139. Coming in third was the Laura Standard with 1082 votes. The I’ve Lived in Hamilton, Victoria Facebook group was abuzz with excitement, especially over the last weekend. Former residents from interstate and as far away as The Hague and Texas joined the voting. The Hamilton community spirit shone through, seeking a win not just for the ‘Spec’, but also Hamilton. It’s not surprising. Many group members are descendants of the residents who worked hard to give Hamilton a great community asset back in 1951. 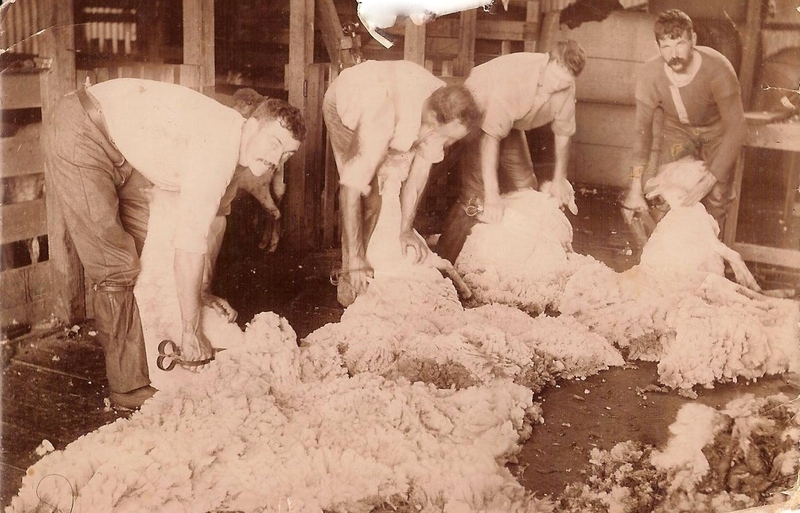 Along with the Hamilton voters, there was also many Western Victorian family and local historians who voted, aware of the benefits the ‘Spec’ will bring to their research. From the Victoria Genealogy Facebook group to the Rootsweb Western District mailing list, the word was out – “Vote for the Spec”. So thank you Inside History Magazine and the National Library of Australia for giving us the chance to decide on a newspaper. We look forward to the next stage of the ‘Spec’s’ path to digitisation, a crowd-funding project. I will keep you posted with news of that as it comes to hand.